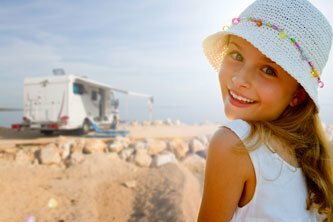 The RV is the perfect formula for a family vacation. If your child still needs a car seat, we strongly recommend bringing your own. First of all, most airlines will let you check a car seat with your luggage, free of charge. Second, you know how your seat works and how to fasten it securely. For insurance reasons, the agents at your car rental location are not allowed to help you to install a rented car seat. Note that the seats in the back of the RV often have only lap belts (no shoulder belt). Most RVs have two seats with anchors for securing child's car seats. Class C RVs (ideal for families) always have a double overcab bed above the driver's cabin, wide enough for adults to sleep in. Many travellers have their children sleep in the overcab bed, but worry that they will roll out of bed during the night as there is no barrier to prevent this from hapening. There are two solutions to this problem. First of all, young children can be placed crosswise in the overcab bed (with cushions between them). Otherwise, the dinette bed or sofa-bed are good options. Read this article to find out whether you can let your children sleep while you drive. RV suppliers rarely rent baby cribs. 1- Buy a travel crib before you leave home. 2- Use the existing bed and place cushons around the baby to prevent her from falling. Some parents simply place the cushions on the ground for the baby to sleep on: impossible to fall! Can I drive while the children are sleeping? Where can I sleep in my RV?